Power tool manufacturer Bosch has introduced a new 2.6-gallon cordless jobsite vacuum cleaner that offers sustained suction for up to 24 minutes using the brand’s 18-volt battery. The company says the product’s canister design features a “Bosch-exclusive” rotational airflow technology, “which helps ensure consistent vacuum performance. It weighs only 10.2 Lbs. (tool with attachments only, not including battery). 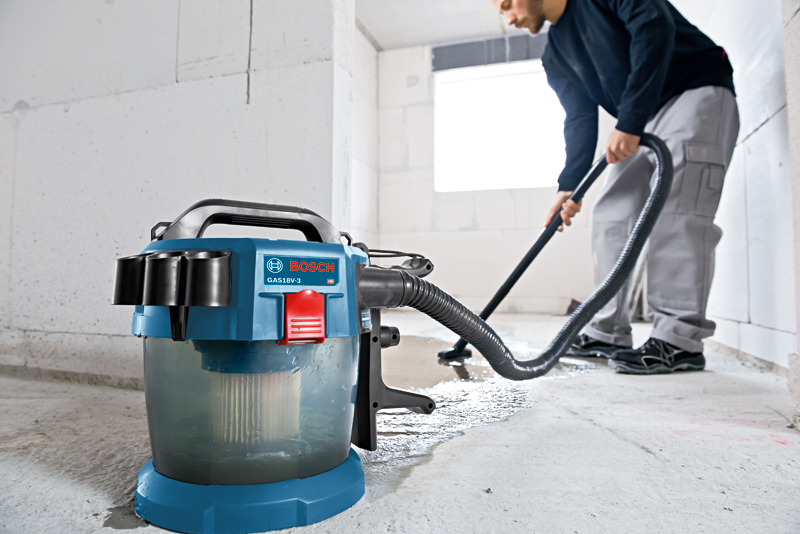 Offering a washable HEPA filter that captures 99.97 percent of particles at 0.3 microns and larger, the Bosch GAS18V-3N vacuum delivers up to 51 cubic-feet-per-minute airflow and provides wet suction of up to a gallon and a half of water for disposal. Adapters for connecting the vacuum cleaner to various Bosch power tools and their dust hoods are available separately. The vacuum works with the brand’s 18-volt battery platform, delivering up to four minutes of runtime per battery amp hour, the company says. It comes with a 5.25-foot hose, three extension tubes, a crevice nozzle, and a floor nozzle. The battery and charger are sold separately.